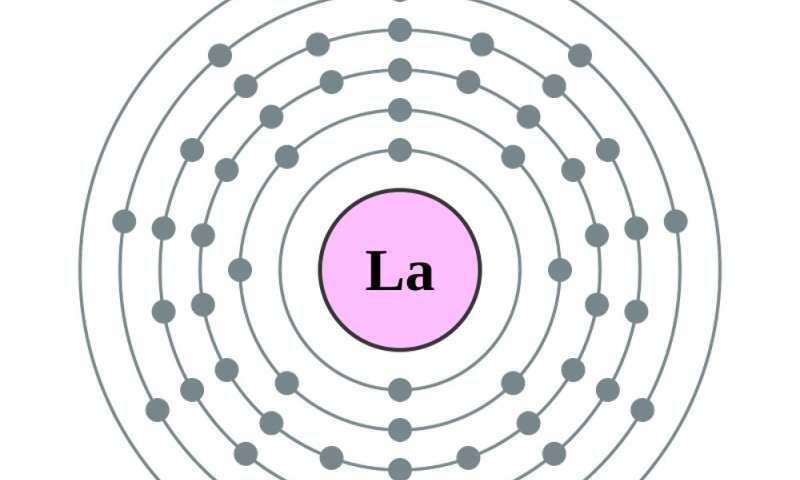 It's significant that there are 15 rare earth elements: Chemistry students may recall that when electrons are added to an atom, they collect in groups or layers, called orbitals, which are like concentric circles of a target around the bull's-eye of the nucleus. The innermost target circle of any atom can contain two electrons; adding a third electron means adding one in the second target circle. That's where the next seven electrons go, too – after which electrons must go to the third target circle, which can hold 18. The next 18 electrons go into the fourth target circle. 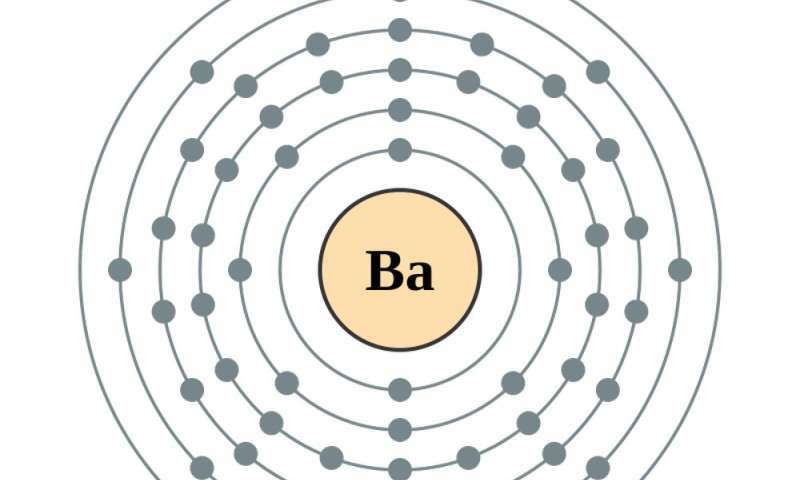 That's when the atom becomes barium, atomic number 56, and those empty spaces in earlier target circles start to fill. Adding one more electron – to make lanthanum, the first in the series of rare earth elements – puts that electron in the fifth circle. 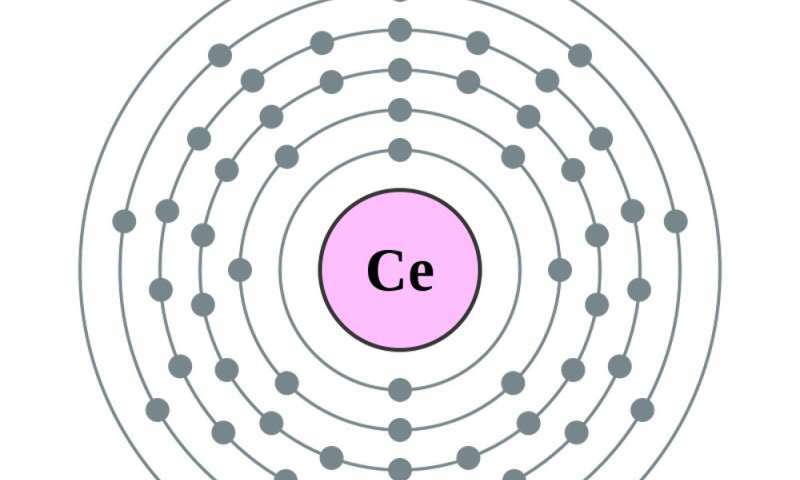 Adding another, to make cerium, atomic number 58, adds an electron to the fourth circle. Making the next element, praseodymium, actually moves the newest electron in the fifth circle to the fourth, and adds one more. From there, additional electrons fill up the fourth circle. In all elements, the electrons in the outermost circle largely influence the element's chemical properties. Because the rare earths have identical outermost electron configurations, their properties are quite similar. No. They're much more abundant in the Earth's crust than many other valuable elements. Even the rarest rare earth, thulium, with atomic number 69, is 125 times more common than gold. And the least-rare rare earth, cerium, with atomic number 58, is 15,000 times more abundant than gold. They are rare in one sense, though – mineralogists would call them "dispersed," meaning they're mostly sprinkled across the planet in relatively low concentrations. 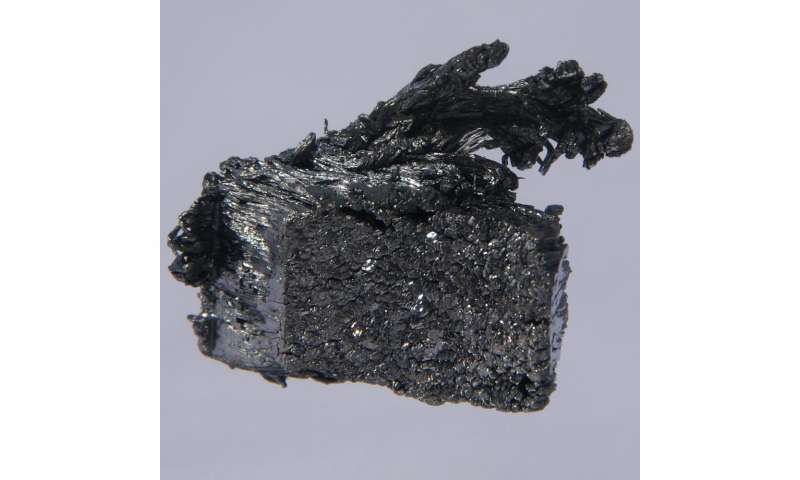 Rare earths are often found in rare igneous rocks called carbonatites – nothing so common as basalt from Hawaii or Iceland, or andesite from Mount St. Helens or Guatemala's Volcano Fuego. There are a few regions that are have lots of rare earths – and they're mostly in China, which produces more than 80 percent of the global annual total of 130,000 metric tons. Australia has a few areas too, as do some other countries. The U.S. has a little bit of area with lots of rare earths, but the last American source for them, California's Mountain Pass Quarry, closed in 2015. 3. If they're not rare, are they very expensive? In the last half of the 20th century, europium, with atomic number 63, came in to wide demand for its role as a color-producing phosphor in video screens, including computer monitors and plasma TVs. It's also useful for absorbing neutrons in nuclear reactors' control rods. 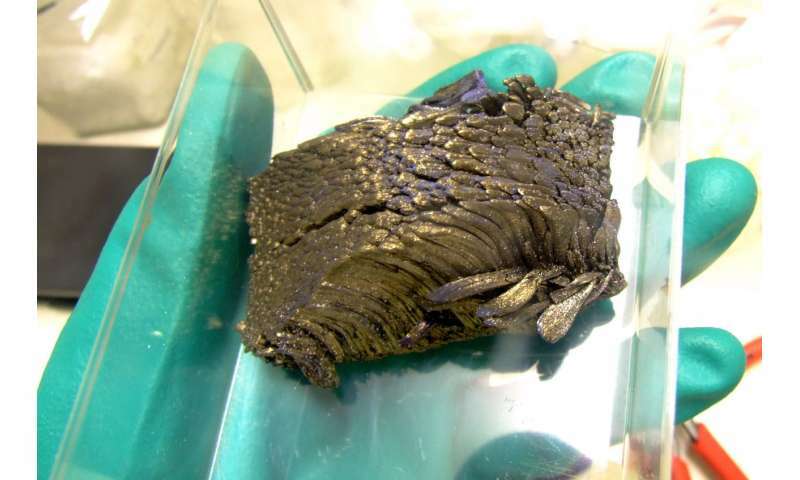 Other rare earths are also commonly used in electronic devices today. 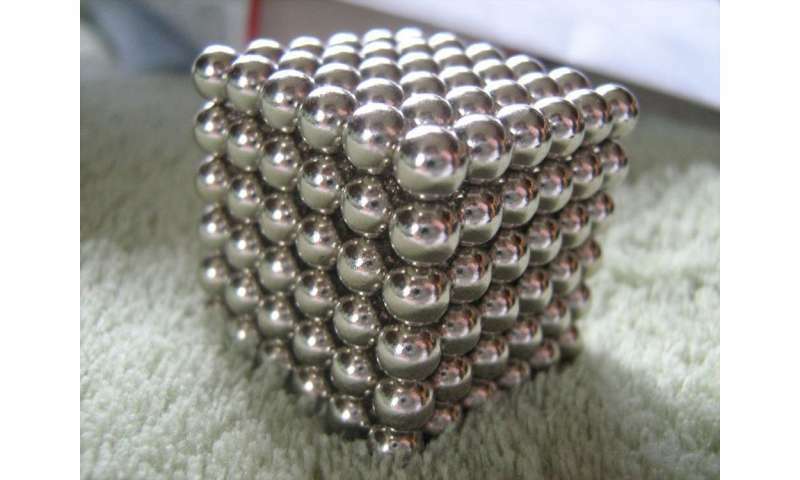 Neodymium, atomic number 60, for instance, is a powerful magnet, useful in smartphones, televisions, lasers, rechargeable batteries and hard drives. An upcoming version of Tesla's electric car motor is also expected to use neodymium. Yep, the dumpster fire wants Flash Gordon rocketships and Buck Rodgers reyguns.. And guess whar? The senile buffoon has unleashed a trade war with the country that produces the materials for trumpenella's comicbook heroics! China has already paid the Bogus POTUS substantial bribes and lucrative concessions. Trouble is, as the definition of a "dishonest" politician? He won't stay bought! But like a metastasizing cancer, the Clownfather Donnie Trumpery constantly makes new extortionate demands to enrich himself and his trundle full of wanna-be-aristoprats. Why does no one ever speak about the Japanese exploration of the sea/ocean floors?